The sudden death of young competitive athletes during exercise is a shocking and widely publicized topic. These unexpected events have attracted increasing amounts of attention in the general public, particularly with the growth of online and social media. Protocols for pre-athletic participation screening have come under scrutiny to refine the detection of “silent” cardiovascular diseases that predispose young individuals to sudden cardiac death (SCD). The most common diseases include hypertrophic cardiomyopathy, coronary artery anomalies, channelopathies such as long QT syndrome, myocarditis, arrhythmogenic right ventricular cardiomyopathy, aortic dissection, coronary artery disease, dilated cardiomyopathy and Wolff-Parkinson-White syndrome. The ideal screening method for this rare but dangerous set of diseases in young athletes remains debated. The true incidence of sudden death in young athletes is unclear. Most of the literature has relied on a retrospective evaluation of institutional reports, insurance claims, and internet searches of media reports leading to underestimation of the number of deaths. Prior studies of SCD in collegiate athletes have found a range of 1.6 to 2.4 deaths per 100,000 athlete years. (1-3) In comparison, the only prospective study of U.S. high school athletes showed a similar overall incidence of 1.14 per 100,000 athlete years. (4) Even this is an underestimation, since it only included events at the home high school during school hours, and deaths at night or away from school were not included. A reasonable estimate of SCD is 1:50,000 to 1:80,000 in high school athletes and 1:50,000 in college athletes, although males, African Americans, and basketball players are at higher risk. (5) A prospective database of a defined population with the subsequent incidence of SCD is needed to truly determine event rates. In an effort to limit the sudden death of otherwise healthy young individuals, the American Heart Association (AHA) recommends standardized preparticipation screening of high school athletes entailing a 12-step process evaluating symptoms, family history, and a tailored physical exam. (1) However, there is some evidence questioning the efficacy of this screening process. Maron and colleagues retrospectively evaluated the incidence of SCD in young athletes from 1985 to 1995. (6) Despite undergoing preparticipation screening, 115 athletes died during competition, with only four of them (3%) identified as having a cardiovascular abnormality beforehand. Fudge and colleagues recognized these concerns with the standard screening process of history and physical alone, and sought to determine the potential benefit of a resting 12-lead electrocardiogram (ECG). In the greater Seattle area, 1339 individuals (age 13-24) were evaluated with a standardized history, physical exam, and resting ECG with referral for a limited echocardiogram if abnormal. (7) A total of 586 of the 1339 participants (44%) were referred for limited echocardiogram due to an abnormal history, physical exam, or ECG. Only five individuals (0.4% of the screened population) were identified with a cardiovascular illness at potential risk for SCD, indicating a false positive rate of 40%, most of which were due to an abnormal history. The standard preparticipation screening process is worrisome for low specificity of the targeted cardiovascular diseases, leading to the evaluation of a high number of healthy individuals with added cost. The psychological implications of students referred for an unnecessary screen could also be concerning. This question was evaluated in a recent prospective study that screened 952 high school athletes with standard history and physical exam with or without ECG. (8) There was no indication of excess anxiety in response to false positive results amongst the students. Those screened with an ECG also felt safer during competition and more satisfied with their screening compared to those who did not undergo ECG evaluation. Although impressive, the significant improvement in the rate of sudden cardiac death of young Italian athletes remains contested. (1, 11) Some have cited the difficulty in comparing a two-year pre-screening period with a subsequent 20-year follow-up. The potential benefit of history and physical screening alone is also impossible to separate in this retrospective study that instituted its screening protocol with history, physical exam, and ECG at the same time. With the AHA recommendations, the preparticipation physical evaluation is endorsed by almost every state for evaluation of students prior to athletic participation. However, there is significant variability across the country in the screening protocol. More importantly, as a study from Washington state showed, there is also a lack of awareness of the AHA recommendations by primary care providers, pediatricians, and high school athletic directors. (12) It is important when discussing screening that this process should not include evaluation of those with a family history of cardiomyopathies and channelopathies. These people should be evaluated according to a more intensive manner, which may include an electrocardiogram, echocardiogram, treadmill test, or genetic testing. Extrapolation of the European data for universal ECG screening to the U.S. is limited by its unique medical system and demographics. To date, the Italian screening system has been performed by physicians with training specifically in sports medicine. (10) In contrast, the current screening process in the U.S. is managed by a combination of sports medicine specialists, primary care physicians, and non-physician practitioners. (1) Limited expertise in the field of ECG interpretation undoubtedly restricts the efficacy of the standard preparticipation screen, but this can be learned. For example, Drezner and colleagues evaluated the accuracy of ECG interpretation of normal and abnormal athlete ECGs by 60 physicians, including primary care residents, primary care attendings, sports medicine physicians, and cardiologists. (13) The primary care residents and attendings initially read the ECGs with 73% accuracy, followed by an improvement to over 90% accuracy, with use of a two-page ECG criteria tool specifically tailored for evaluation of the athlete ECG. To counter this issue, there has been a drive for continued evolution of ECG criteria for competitive athletes. An ongoing challenge has been the differentiation of ECG findings reflective of benign physiologic changes in the well-conditioned athlete as opposed to true cardiovascular disease. Most recently, the “Seattle criteria” were released. (15) These criteria attempt to balance an appropriate ascertainment of true disease while limiting the false positive rate. Abnormalities include T wave inversions (Figure 1), ST depression, Q waves, wide QRS complexes, left axis deviation, left atrial enlargement, right ventricular hypertrophy, delta wave, long or short QT intervals, and frequent PVCs. More importantly, normal findings for athletes include isolated voltage criteria for left ventricular hypertrophy (Figure 2), sinus bradycardia, sinus arrhythmia, first- or second-degree type 1 AV block, early repolarization, or ST segment elevation in the anteroseptal precordial leads (V1-V4) of black athletes (Figure 3). To promote physician education in the use of Seattle criteria, an online training module was created at http://learning.bmj.com/ECGathlete. The potential benefit of athlete-specific ECG criteria was illustrated in a recent presentation at the 2014 Heart Rhythm Society Scientific Sessions by one of the authors (JMP). There were 4,812 high school athletes who underwent screening with a history, physical, and ECG interpreted with the ESC and/or Seattle criteria. This study demonstrated a false positive rate of 22.3% with a standard history that was significantly reduced to a false positive rate of 3.6% when utilizing ECG alone. Beyond the accuracy of ECG interpretation, the potential cost of universal ECG screening for young athletes in the United States remains unclear. A five-year study at the University of Virginia evaluated all of the institution’s 1473 competitive athletes from 2005 to 2010 with history, physical exam, and 12-lead ECG. Thirteen individuals with “silent” cardiovascular disease were found with a total program cost of $894,870. (16) This equated to $68,836 per finding. Of note, 8 of these 13 findings would have been missed without the screening ECG, with two of these students being excluded permanently from athletics due to their underlying disease. The results of this study are difficult to extend to the entire nation, however, given the concentration of medical resources and expert physicians in an academic center. More has to be done to reduce SCD in high school and college athletes in the United States. In an already costly and stretched U.S. medical system, it is reasonable to perform ECG screening, but should not be considered mandatory. The AHA has encouraged organized screening of this large population via nonprofit local organizations. However, with limited resources, targeted screening may need to be considered knowing there is a higher risk in males, African Americans, and basketball players. Maron BJ, Thompson PD, Ackerman MJ, et al, American Heart Association Council on Nutrition PyA, and Metabolism. Recommendations and considerations related to preparticipation screening for cardiovascular abnormalities in competitive athletes: 2007 update: A scientific statement from the American Heart Association Council on Nutrition, Physical Activity, and Metabolism: Endorsed by the American College of Cardiology Foundation. Circulation. 2007;115:1643-1455. Harmon KG, Asif IM, Klossner D, Drezner JA. Incidence of sudden cardiac death in national collegiate athletic association athletes. Circulation. 2011;123:1594-1600. Maron BJ, Haas TS, Murphy CJ, Ahluwalia A, Rutten-Ramos S. Incidence and causes of sudden death in U.S. college athletes. J Am Coll Cardiol. 2014;63:1636-1643. Toresdahl BG, Rao AL, Harmon KG, Drezner JA. Incidence of sudden cardiac arrest in high school student athletes on school campus. Heart Rhythm. 2014;11:1190-1194. Fudge J, Harmon KG, Owens DS, et al. Cardiovascular screening in adolescents and young adults: A prospective study comparing the Pre-participation Physical Evaluation Monograph 4th Edition and ECG. Br J Sports Med. 2014;48:1172-1178. Asif IM, Johnson S, Schmieg J, et al. The psychological impact of cardiovascular screening: the athlete's perspective. Br J Sports Med. 2014;48:1162-1166. Corrado D, Basso C, Pavei A, Michieli P, Schiavon M, Thiene G. Trends in sudden cardiovascular death in young competitive athletes after implementation of a preparticipation screening program. JAMA. 2006;296:1593-1601. Corrado D, Pelliccia A, Bjørnstad HH, et al. Cardiovascular pre-participation screening of young competitive athletes for prevention of sudden death: proposal for a common European protocol. Consensus Statement of the Study Group of Sport Cardiology of the Working Group of Cardiac Rehabilitation and Exercise Physiology and the Working Group of Myocardial and Pericardial Diseases of the European Society of Cardiology. Eur Heart J. 2005;26:516-524. Sharma S, Estes NA, Vetter VL, Corrado D. Clinical decisions. 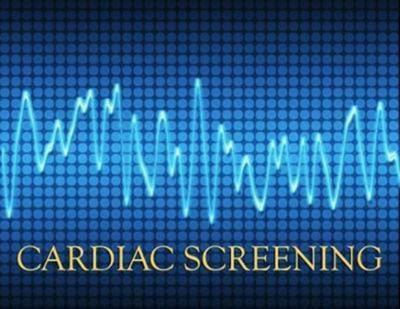 Cardiac screening before participation in sports. N Engl J Med. 2013;369:2049-2053. Madsen NL, Drezner JA, Salerno JC. Sudden cardiac death screening in adolescent athletes: An evaluation of compliance with national guidelines. Br J Sports Med. 2013;47:172-177. Drezner JA, Asif IM, Owens DS, et al. Accuracy of ECG interpretation in competitive athletes: the impact of using standised ECG criteria. Br J Sports Med. 2012;46:335-340. Baggish AL, Hutter AM, Wang F, et al. Cardiovascular screening in college athletes with and without electrocardiography: a cross-sectional study. Ann Intern Med. 2010;152:269-275. Drezner JA, Ackerman MJ, Anderson J, et al. Electrocardiographic interpretation in athletes: the 'Seattle criteria'. Br J Sports Med. 2013;47:122-124. Malhotra R, West JJ, Dent J, et al. Cost and yield of adding electrocardiography to history and physical in screening Division I intercollegiate athletes: A 5-year experience. Heart Rhythm. 2011;8:721-727.